What's your favorite tinsel color? Candle light gold or icy silver? I love dressing and decorating for the holidays! Now that November has arrived we are officially into party and gifting season! Time to order now for holiday delivery. All made to order designs will ship in time for the holiday when your order is received by December 1st. Pictured here is my Double Diamond link bracelet in 18k gold and darkened sterling silver ready for an overseas trip to the UK! I love that I can reach my customers virtually anywhere. For immediate gratification (two for them and one for me is ok in my book!) there are many stylish treasures ready to ship here on my website! I can help you add some gorgeous to your party outfit! When you buy a gift from my online store you will be able to exchange it through January 31st 2018! Now that's worry free giving! I like to eat chocolate, give gifts, buy jewelry and flowers all the time. Seattle is a great place for chocolate. We are the home of some world renowned chocolate makers like Theo's and Fran's. If I want to really indulge I go to the Chocolate Box. Located downtown Seattle between 1st and 2nd Ave. on Pine. This treasure trove carries dozens of artisinal chocolate brands like Chocolat Vitale and Pink Peony of Bainbridge Island. 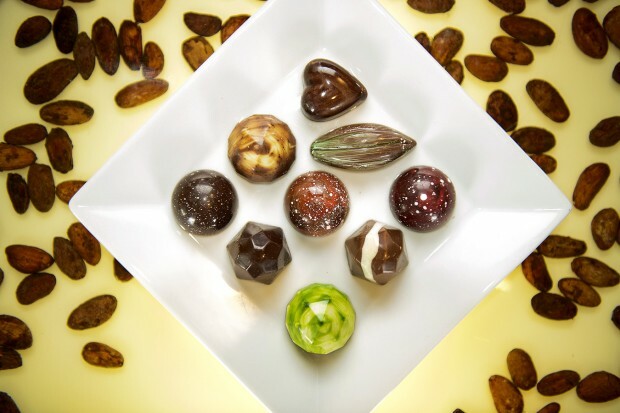 At Chocolate Box you will also find Organic and Fair Trade, if you just can't get enough they teach Truffle Making Classes! Now for the gift of jewelry, always memorable and always appreciated! The Double Diamond Link Bracelet by Gina Pankowski in Sterling Silver with Garnet Heart (.70 ct) and gun metal patina. Finally the flowers, for me are best in the garden where they bloom and bloom again! This long stemmed red rose was grown from a bouquet my sweet gave to me many years ago. Yep I lopped off the buds from half of the bunch and planted the stems. It was February and by late summer that year I had three healthy plants of long stem red roses! A couple garden moves later I still have two of the shrubs and many flowers to pick all summer. In case you are wondering, my love still gives me bouquets occasionally!